Illustration courtesy of the Ken Allen Papers, Gerber/Hart Library and Archives, Chicago. When historians do their research, many of us often operate with a set of categories that help to sort and divide the past into neatly organized separate boxes. There are histories of politics and movement activism; of social life and community; of culture and artistic production. But, alas, life is not always so neatly segmented. Political activism can be a force for building community. Socializing in bars sometimes became the setting for mobilizing people, most famously at the Stonewall Inn in 1969. And cultural creativity can help articulate political grievances and rouse people to action. The haziness of history’s boundaries came home to me as I worked my way through two small, but related, collections at Gerber/Hart: the papers of Ken Allen and Wendell Reid. Their materials stretch across the 1980s and 1990s. Each of them was active in the Chicago chapter of Black and White Men Together (BWMT) which, in some cities, morphed over time into Men of All Colors Together. Black and White Men Together formed in San Francisco in the spring of 1980. 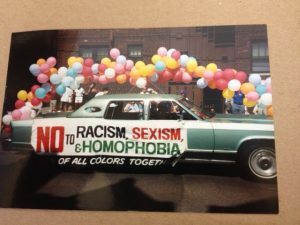 By the time it held its first conference in San Francisco during Pride Month in 1981, there already were ten chapters, stretching from cities in California to Arizona, Missouri, Florida, North Carolina, Pennsylvania, and Michigan. Three hundred men attended that first national convention. By 1987, based on the holdings in these collections, at least 17 chapters were regularly producing newsletters, some of which were quite substantial. In 1991, on the 10th anniversary of its first convention, there were at least 25 chapters, including in cities not generally thought of as hubs of gay male life – among them, Hartford, Connecticut; Youngstown, Ohio; and Louisville, Kentucky. From the outside, BWMT was often perceived as what today one might describe as a “meet-up” group for gay men whose sexual attractions crossed a color line. And, undoubtedly, it did serve that purpose, filling a need that was all the more pressing because evidence abounds that in the 1970s many gay bars implemented policies of excluding African American men by demanding extra pieces of identification. 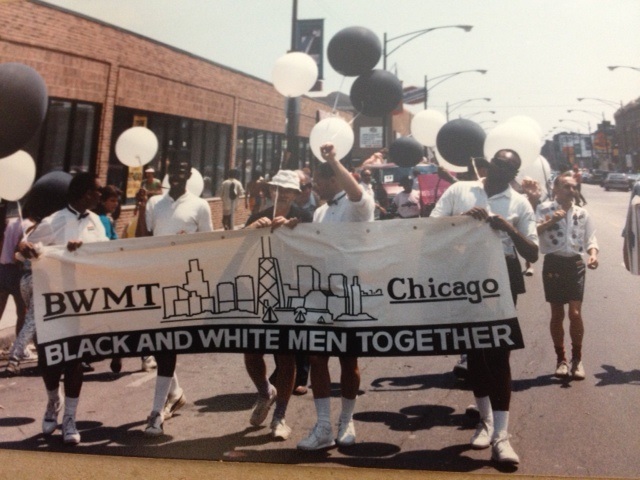 BWMT provided safe spaces for interracial socializing. That socializing in turn helped build broad social networks that facilitated organization building. This orientation toward movement activism also shows up at the local level. Box Six of Ken Allen’s papers is filled with newsletters from local chapters. Those from 1987 are overtly recruiting and encouraging readers to come to the 1987 March on Washington. Many newsletters were important sources of information on the growing AIDS epidemic, at a time when mainstream media coverage was still inadequate. The Los Angeles chapter successfully applied for a grant to engage in community-based AIDS education. Taken together, these collections provide a glimpse into the kind of organizing that was being done by gay men in the 1980s and 1990s to challenge racism both within and beyond the gay community in many cities across the U.S.